Understand the different types of relief valve and when and where to specify them. All hydraulic power supplies need to have a pressure relief valve somewhere in the circuit, to act as a safety protection device to stops the pressure getting too high if something else in the circuit fails. A common location for these valves is directly after the pump. 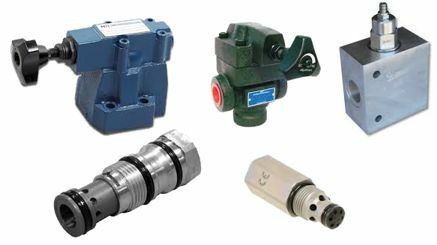 Pressure relief valves can provide protection against high external loads acting on actuators that would increase the hydraulic pressure above the equipment's safe working limits. Where check valves are used in cylinder lines then pressure relief valves can provide protection against thermal expansion of the fluid, which can also cause excessive pressures. Pressure relief valves are occasionally used to control system or load pressure levels but because this generates heat and is an inefficient use of energy, they are far more commonly used as over-pressure protection devices. One area where relief valves are used to control pressure levels is within pilot pressure control systems. Here the pilot flows across the relief valves are small but they act on other main spool or logic elements that control the main flow, without such inefficiency. Another place where you may find a good quality relief valve is controlling the pressure on a test rig for example. Here it is acting as a convenient way to control the load pressure. By adding an electrical solenoid relief valves become electrical unloader valves e.g. as soon as the system registers a fault, or is turned off, the power is removed from the solenoid and the relief valve opens to ensure there is no load pressure. In their simplest form, a pressure relief valve can be a ball bearing held against an orifice by a spring. As the pressure increases on the ball seat area, the ball is pushed back against the setting of the spring. Better valves will have hardened seats and shaped poppets to give better pressure vs flow characteristics and more consistent operation throughout their life. High flow valves tend to have two stages with a small pilot relief valve that opens a larger, second, main stage valve. Relief valves open when the pressure across them exceeds a pre-set limit. 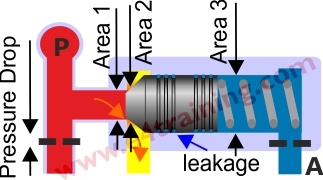 However, if the downstream pressure is acting on top of the valve poppet, (with the spring), then the differential pressure at which the relief valve opens, will change. Often multistage relief valves will have external pilot drains or feeds to ensure the control pressure level is stable and reliable. See also pressure control valve in our symbols sections for more details. All relief valves are not the same. Simple ball and spring valves are cheap to produce but will not have such a good operating characteristic as to ones where the manufacturer has developed a carefully shaped poppet nose. This may not be a problem if it's purely a safety relief valve that should never operate, however, controlling the pressure against different flow rates on a test rig will require a much better standard of valve. Relief valves options include direct acting, pilot operated 2 stage, electrical unload, electrical proportional, integrated or line mounted versions. Valves A, B and C in the diagram show direct-acting relief valves. Valves A and B have significantly different poppet designs including area ratio, damping and nose shape. Performance curves will also be different. Valve C is a differential area valve where the higher pressure is applied to port 2 and the low pressure is applied to port 1 and the back of the poppet. Valves D and E are pilot operated valves, D is a cartridge valve and E platen mounted valve. Valve E has a positive, sharp-edged nose closure seat. This will give less leakage, better contamination resistance and an improved PQ (Pressure vs Flow) characteristic. Valve E also has a number of passageways where pilot feeds can be taken from different sources or small orifices added to control the dynamic performance, although opening times are always likely to be slower than with direct operated valves. Relief valves in accumulator safety blocks must be certified and sealed. These are different from normal relief valves because accumulators fall under the PED (Pressure Equipment Directive). You must not reset or replace these valves with non-certified components. Learn more about relief valves in our 'Professional Training Section'. Understand their design features, performance limits, and how to specify relief valves.